On April 1, many decades ago a young couple was on their way to church. As they walk toward the church, she grabs her belly and says, "I am going into labor." The husband starts to help her back into the car and she smiles and says, "April Fools!" The following week, the young couple goes to church again. She once again says, "I'm going into labor." This time the husband smiles and says, "I'm not falling for that again." "I am not joking. I am going into labor. " Off they go to the hospital. These were the days when husbands waited in the waiting room for the news. The doctor steps out and holds up his hand. The husband and now father, sees the doctor's hand and thinks that the doctor is signaling him V for victory. The doctor shakes his head and says, "No, two babies!" Mr MISTI was one of the two babies. Happy Birthday! 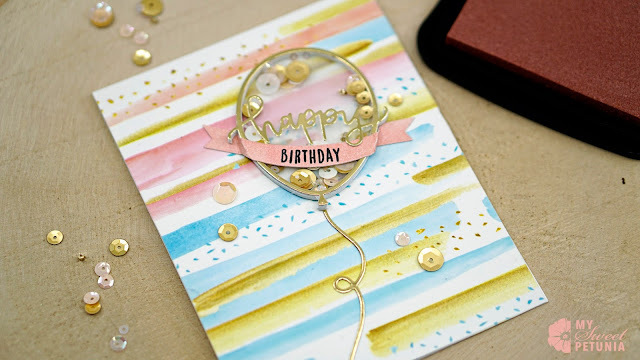 For this card, I used the Altenew Watercolor Strokes Washi for the background. I made a shaker using the Happy Balloon Die from Concord & 9th. To make a more masculine card, just use the portions of washi that have the blue. I didn't bother doing this for Mr MISTI, he doesn't mind the pink. Thanks for stopping by. Enjoy the video. Super cute and fun shaker card! How smart to magnetize your work surface. It is awesome. My magnets don't disappear. You can always you the backside of the MISTI in a pinch. I love your card Iliana and the balloon die is fabulous. ♥ IT! Such a cute story about your hubby's birth, imagine their surprise. What an awesome card! I love the balloon shaker and how well it works with the washi tape. Thanks for the tips for adhering things onto the washi. I didn't realize that tape adhesive wouldn't work that well. My elements kept coming loose. I had to take a second and then it was like a light bulb. Thanks for stopping by! That is a cute story about the twins being born--happy birthday to your husband! I enjoyed watching you make the card. The pop of gold is so pretty. Thanks so much. I use a lot of gold when I am not sure. I love that the shaker is on top of the card. Very nice. What is Elizabeth craft adhesive and how is that different from Stick-it?? Stick-It is a very thin adhesive sheet. The layer of adhesive is thin and the backing is thin so it makes it easy to die cut. The Elizabeth Craft adhesive is more like a Scor tape. The adhesive is thicker and the backing is thicker. You can die cut with it but the backing is usually in tact. Thanks for watching. Cute card, love that balloon. Love the idea of using magnets on my craft mat. Thanks for sharing and inspiring us. What a fun card! I hope Mr. MISTI had a great birthday! Fun story you shared with us! Oh soooooo CLEVER!!!! Lovely shaker card....great story too! Such a fun card. I love the way you built your shaker element. This card is so beautiful! I love it. Making it look so fun and exciting. Dying to make it.